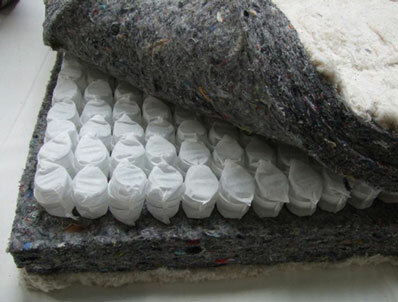 The Cambridge futons pocket sprung and standard filling mattress includes 2 layers of natural lambs wool, 4 layers of quality rebound felt and a 2” pocket sprung unit in the middle. This combination of fillings makes a great futon which is ideal for people who like the softer feel of a pocket-sprung mattress but with the qualities of a luxury futon.. The Pocket Sprung and Standard Filling Futon mattress is made to order in a 140cm (4ft 6") double size for a standard 3 seater wide futon. The futon mattress is 190cm long. This futon mattress can only be used on a 3 seater one fold bed.